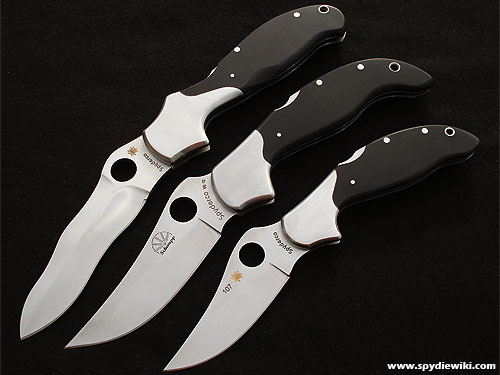 The C105 Persian 75mm by Ed Schempp was introduced in 2006, the same year its larger version, the C83 Ed Schempp Persian Folder was discontinued. In 2010 also the C105 was discontinued. 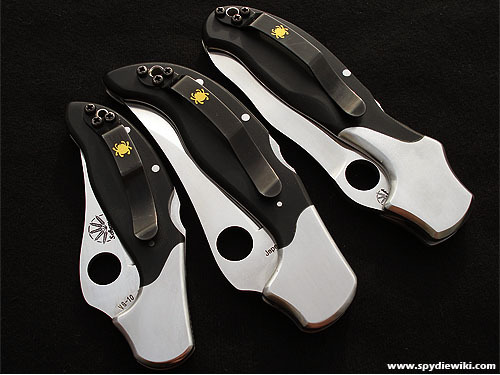 The C105 Persian appeared in all annual Spyderco product catalogs since 2006 (older, newer). "Custom knifemakers are more than simply steel junkies. Ed Schempp is a wheat farmer, metallurgist and celebrated knifemaker whose Persian Folder introduces Classic Western with Exotic East. Persian knives traditionally are fixed blades but Ed integrates this indigenous shape into a folding knife. Comprised of graceful curving lines, the new smaller Persian Folder 75mm is eye-catching with black Micarta handle scales capped by polished stainless bolsters. On the handle a series of finger choils position the hand for complete control over the cutting edge. Its Eastern inspired blade arches into a curving belly and ends in a graceful upswept tip. The 2-15/16” (75mm) blade is made of high-performance VG-10 steel (hollow-ground) with a prominent hump positioned above the hole as a thumb leveraging spot. The pocket clip positions the folder to carry right-handed tip-up. A small portion of steel removed from the locking lever offers additional lock safety and is called a David Boye Dent. It permits tightly gripping the handle without grasping with enough force to inadvertently disengaging the lock during use." This page was last modified on 20 July 2013, at 19:27.